It’s week 4 of Gluten-Free Holiday and this week’s theme is Christmas and Hanukkah Favorites – specifically, entrees and side dishes. Hanukkah is already in full swing, and Christmas is just weeks away. Diane over at The W.H.O.L.E. Gang is hosting this week, and is sharing this amazing recipe for chipolatas. Seriously, they make my mouth water just looking at them. 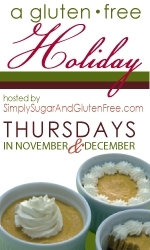 And of course, in our Gluten-Free Holiday style, there are more amazing gluten-free cookbooks to win. 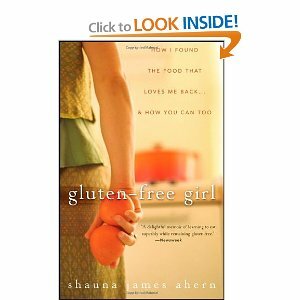 One copy of Gluten-Free Girl: How I Found The Food That Loves Me Back…And You Can Too by Shauna James Ahern. 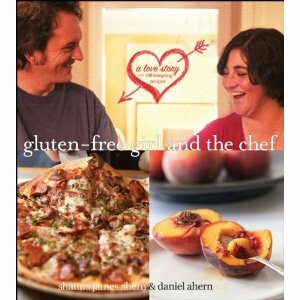 And one copy of Gluten-Free Girl and the Chef, also by Shauna James Ahern and Daniel Ahern. 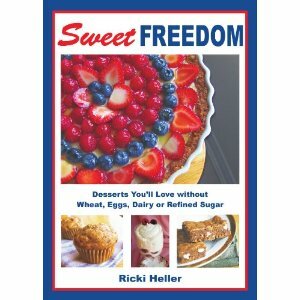 And three e-book trios, each including one copy of Sweet Freedom, one copy of Desserts Without Compromise, and one copy of Anti-Candida Feast Ebook, all by Ricki Heller of Diet, Dessert and Dogs. My submission for this week’s theme is something that I look forward to every holiday season – tamales. While I don’t always make my own, I have found that they’re not all that difficult to make. (They are time-consuming, however.) But it’s great fun, and you’ll be rewarded with a lovely, spicy, flavorful treat. Many times, we will get together with my husband’s side of the family on Christmas Eve. Rather than a fancy, sit-down Christmas dinner, we instead enjoy a casual, but generous spread of various snack foods, ranging from the ever-famous cheese dip to cookies and cake. 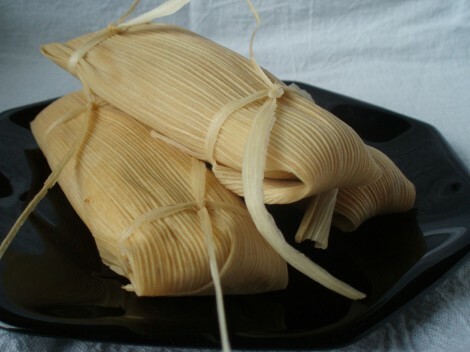 In the past few years, we’ve brought tamales to our celebration, and they’re always a huge hit. With a bit of salsa, bottled hot sauce, or even unadorned, they are the perfect way to ring in the season. I highly suggest you try to make tamales once – it’s a fun experience, and you’ll be rewarded with delicious treats and smiles from all. Read my tamales recipe here. And don’t forget to visit The W.H.O.L.E. Gang and link up your favorite recipes for Christmas and Hanukkah entrees or side dishes, and enter for a chance to win some amazing cookbooks! This tortilla soup recipe is closely based off of a Quickfire Challenge I saw on Top Chef Masters a few weeks back. Chef Marcus Samuelsson prepared a chicken soup with crispy tortilla strips and goat cheese guacamole that had me drooling. I had to make it. So I visited the recipe found here and filled in the blanks, adjusting to my tastes. And even with the near-100 degree temperatures outside, this soup hit the spot – it was just a touch spicy, bursting with flavor, and the goat cheese guacamole was cooling and fresh. If I was to make it again (and there will be an “again”), I’d have to modify it to be dairy-free, of course. I’d have to give up the goat cheese in the guacamole, and substitute either almond milk or coconut milk for the cream, but the flavors would still be there in full force. It’s a lovely tortilla soup – no wonder Chef Marcus Samuelsson did so well in Top Chef Masters! Pour the olive oil in a large skillet and heat over medium heat. Add onion and saute for 5 minutes, or until soft. Add garlic and saute for another minute. Remove from heat and place in a bowl. Scoop the avocado flesh and add to bowl. Add goat cheese and smash the avocado, onion, garlic, and cheese together with a fork. Add in lime juice, jalapeno, bell pepper and cilantro and stir. Season with salt and pepper to taste. Set aside. In a skillet, heat about a half-inch of canola oil over medium heat. Fry tortilla strips in batches until crisp, about 1 minute, and drain on paper towels. Set aside. In a large skillet, heat 1 tablespoon oil. Add onions and saute for 5 minutes or until soft. Add garlic and saute for an additional minute. Add chicken stock and tomatoes and bring to a boil. Reduce to low heat and simmer for 15 minutes. Add cumin, salt, and chicken and stir, and simmer for an additional 5 minutes. In a bowl, whisk together the eggs and cream. Ladle one or two spoonfuls of the hot soup mixture into the bowl while whisking, and whisk until incorporated. Then pour the egg mixture back into the soup, whisking until incorporated. Allow to cook for another minute, and then add lime juice and half of the green onions and cilantro. 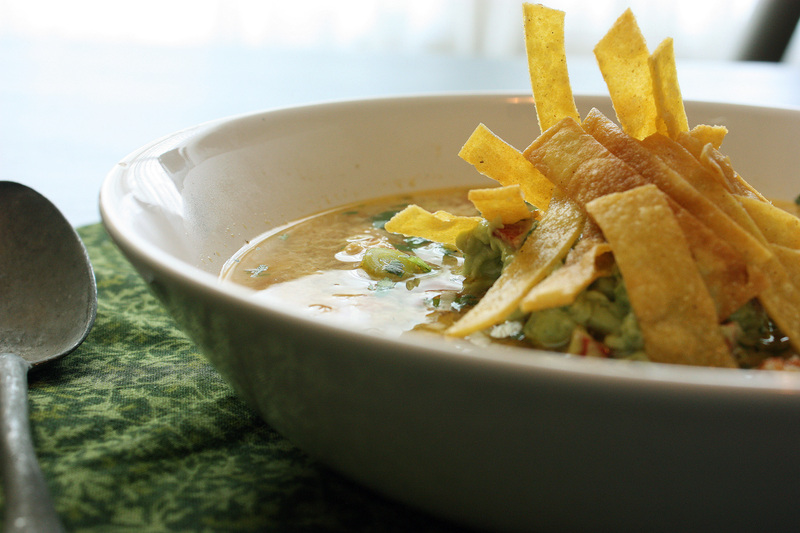 Serve soup topped with the remaining green onions, cilantro, guacamole, and tortilla strips. Serves 4. I love it when challenge recipes don’t need tweaking to make them gluten-free. Hooray for that! And while enchilada recipes are no stranger to this blog (see here, here, and here – yes, I realize not all are gluten-free…some of those are a long time ago! 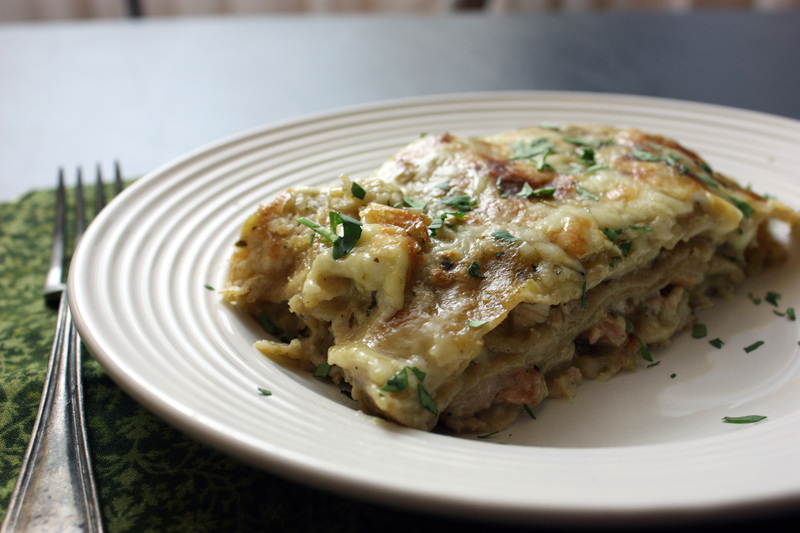 ), I will admit I’ve never created a stacked enchilada recipe before. Now I can appreciate why some people choose to make enchiladas this way! It’s a) easier, and b) you get more of that lovely corn tortilla flavor in each bite. I’ll definitely try this recipe and other variations again. Our hosts this month, Barbara of Barbara Bakes and Bunnee of Anna+Food have chosen a delicious Stacked Green Chile & Grilled Chicken Enchilada recipe in celebration of Cinco de Mayo. The recipe, featuring a homemade enchilada sauce was found on www.finecooking.com and written by Robb Walsh. 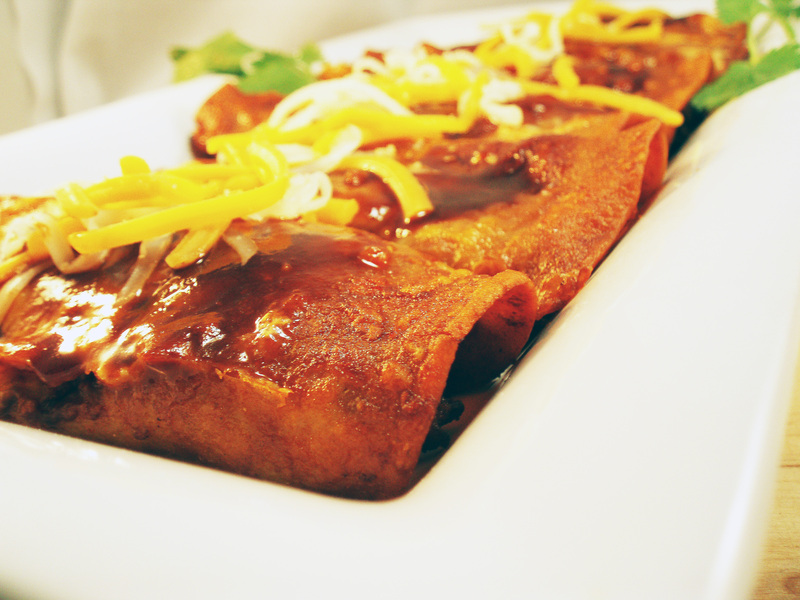 Of course, it doesn’t have to be Cinco de Mayo around here for us to enjoy enchiladas – they’re welcome any time. I did make a few minor changes to the way the green chile sauce was made. I opted to roast the tomatillos alongside the chiles instead of boiling them. I felt this only added to that lovely roasted flavor. I also made it a bit easier on myself by placing not only the tomatillos in the food processor, but also the chiles, onion, oregano, and garlic, and just processed it all together to make the sauce. I also used boneless, skinless chicken thighs instead of breasts, just because it was what I had on hand. Next time I make this, I think I might opt for more chiles, or add a jalapeno or two, just because I love the heat. But these enchiladas were absolutely delicious, especially with the grilled chicken – my husband and I polished off the entire batch for dinner that night and lunch the next day. Lay the chiles and husked tomatillos on a baking sheet lined with foil (this foil will make for MUCH easier clean-up). Place the baking sheet under the broiler and broil until chiles and tomatillos are blackened on all sides, turning every couple of minutes to ensure even browning. Remove and place the chiles in a large bowl. Cover bowl with plastic wrap and allow to cool for 10 minutes or so. Pull the stem and seed core from the chiles, and peel the skin from the chiles (the skin should come off easily, but if not, scrape it a bit). Place tomatillos, chiles, garlic, onion, and oregano in a food processor and process until no large chunks appear. Pour into a medium saucepan and season with salt and pepper. Add chicken stock and bring to a boil over medium-high heat. Reduce heat and simmer for 10 minutes. Make a slurry with cornstarch and a tablespoon or so of water, and add this slurry mixture to the sauce. Continue to simmer for another 10-15 minutes, until sauce has reduced to about 4-5 cups and is thickened. Adjust seasonings as needed. While the sauce is simmering, heat grill to medium heat. Coat the chicken with olive oil and season with a bit of salt and pepper. Grill until just cooked through, 4-5 minutes per side. Allow to cool and chop finely. In a small skillet, heat 3 tablespoons olive oil over medium heat. Using tongs, put a tortilla in the pan and cook until soft and lightly brown, about 15 seconds per side. Drain on paper towels. Repeat with remaining tortillas, adding additional oil as needed to the pan. In a baking dish large enough to hold 4 separate stacks of tortillas (I used a 13X9 baking dish, and my tortillas overlapped a bit – but it worked), ladle a thin layer of sauce. Lay 4 tortillas in the dish and ladle another 1/2 cup of sauce over them. Divide half the chicken among the first layer of tortillas, top with another 1/2 cup of sauce and 1/3 of the grated cheese. Stack another 4 tortillas, top with the rest of the chicken, more sauce and another 1/3 of the cheese. Finish with the rest of the tortillas, top with remaining sauce ( didn’t use all of my sauce) and cheese. Bake uncovered for about 20 minutes, or until the cheese is hot, melted, and bubbly. Let rest for 5 minutes. Serve garnished with cilantro. It’s been too long since my last post. I apologize; it’s been a busy few days. Part of that busyness has been positive – I received my new baby last Wednesday (A Canon EOS Digital Rebel XSi), so I have been trying to learn my way around it. So far, I’m amazed. Amazed at how easy it is to take a halfway decent photo. My little Olympus Stylus 710 was so limited. I put up with it for a long, long while. It was time, and I finally was able to upgrade, so I did. I couldn’t be happier. I fully intended on posting this on Saturday or Sunday, but that’s where the not-so-positive part of my busyness comes in. Unfortunately, my laptop took a fierce dive onto the floor, and my hard drive is toast. My loving techie of a husband is working on it, trying to retrieve data off of the hard drive, and replacing it with another one in the meantime. But I was dead in the water this past weekend. Also dead was the recipe for my taco seasoning – it was on that hard drive. I’ve recreated it today, however, to share it with you here. Unfortunately, my not-so-smart self managed to not back up hundreds of photos on that hard drive. I’m learning my lesson – I promise! Anyway, on to the reason for this post! Brittany wanted to make lunch this time around, and nachos were one of the first things in mind. 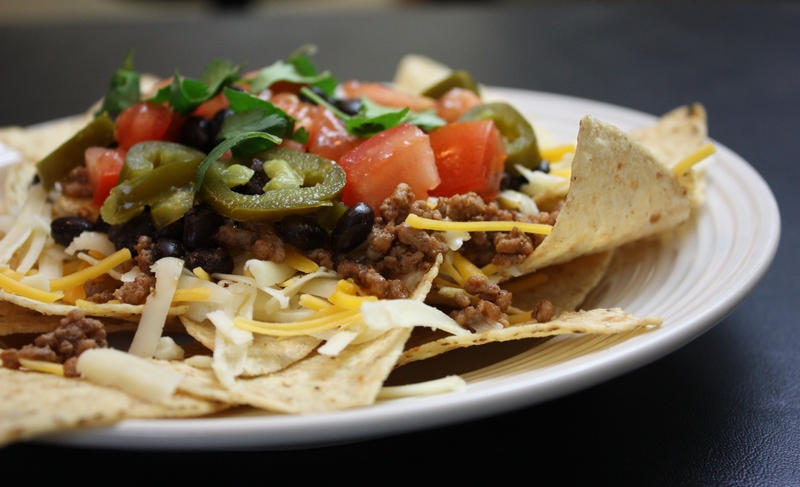 I was up for nachos – this has to be one of the easiest “Kids in the Kitchen” dishes to date! We were eating within 15-20 minutes of our start time. That’s my idea of a nice, easy lunch! Brittany liked these – hers were simply topped with taco meat, shredded cheddar, and pickled jalapenos. “Just like I eat at school,” she said. (The school lunches have either improved since I was in school, or her tastes are skewed…I can’t remember a nacho plate, or if there was one, I’m sure it wasn’t appetizing enough to actually eat.) Regardless, these nachos boast real cheddar, lean hormone-free ground beef, and taco seasoning without gluten, preservatives, or sugar. I would consider that a step up from the school lunch. I topped mine with a mix of cheddar and pepper jack, black beans, tomatoes, and cilantro to add some interest. Nothing fancy, but it was a pretty tasty lunch indeed! Mix together, store in an airtight container in a cool place. Use 2 tablespoons of taco seasoning to season 1 pound of ground beef. To season ground beef: Brown 1 pound ground beef in a skillet at medium-high heat, crumbling with a spatula or wooden spoon. Halfway through the browning process, season with 2 tablespoons taco seasoning and mix throughout. Continue to brown until no longer pink. Drain if necessary. Since the earthquake in Haiti, Lauren at Celiac Teen has been working hard to gather recipes from contributing food bloggers all over the world in an effort to help. She has diligently put these recipes together in an e-book, available for purchase on her blog. All donations received for the e-book will be sent to the Canadian Red Cross (Lauren is Canadian) for purposes of helping victims of the Haiti earthquake. The e-book has many wonderful recipes, and many of them are gluten-free or easily gluten-free adaptable. Read more about how to obtain this e-book and contribute here. This morning, my husband and I were awakened at 7 AM. The kids were awake already. For a Saturday, that’s pretty early. You see, Matt was excited about making breakfast this morning. We had agreed on starting at 9 AM, but by the noise eminating from the living room, he was obviously ready to go well before then. 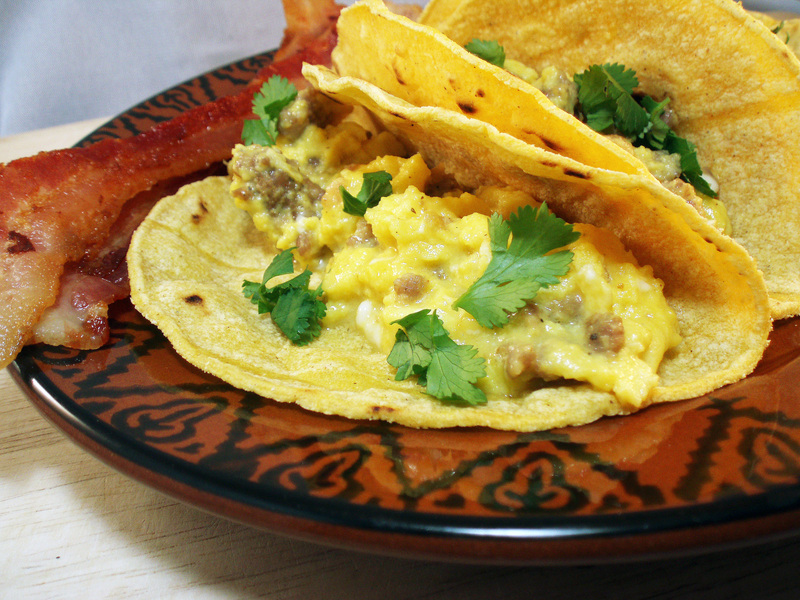 Breakfast tacos (Or taquitos, as they’re called in our house – why? I have no idea.) are Matt’s favorite breakfast treat, and I often make them on weekends. These babies trump any other imagined breakfast food, including donuts, coffee cakes, pancakes – I bet they’d even win over ice cream. When we modified Kids in the Kitchen to include breakfast, it was immediately Matt’s dream to make them. Of course, the version of breakfast tacos enjoyed at our house are not authentic Mexican by any stretch. A straightforward mix of scrambled eggs, cheddar, and spicy pork sausage, wrapped in a tortilla (corn for me, but the kids prefer flour) – there’s nothing pretentious or complicated about this meal. But when you’re feeding hungry teenagers first thing in the morning while still trying to clear the cobwebs from your head, complicated is not what you need. So after a mandatory cup of coffee (for me, not Matt), we started. In the pan went some slices of bacon, and Matt set to grating cheddar. (The hardest part of preparation – he groaned about the task!) After the bacon was removed from the pan, things came together fairly quickly. We browned sausage and drained it, and scrambled the eggs along with the cheddar and sausage. Once the eggs were cooked through, we filled tortillas with the egg-cheese-sausage mixture and rolled them up. The kids could opt to slide a piece of bacon inside, or sprinkle it with Tabasco. I opted for a bit of cilantro. And just like always, there were no leftovers. You can always change up the ingredients in breakfast tacos to your liking. I would love a vegetarian version – black beans, chopped tomato, and jalapenos, or another favorite – nopalitos con huevos. The beauty of a recipe like this is that there really is not a recipe – it’s so versatile and forgiving that you can throw in any combination of ingredients. My favorite kind of recipe! Heat a large skillet to medium heat. If making bacon, go ahead and fry it now and set aside to drain on paper towels. Add the sausage into the pan and crumble with spatula. Brown sausage crumbles until no longer pink, about 5-7 minutes. Remove and set on paper towels to drain. Scramble the eggs along with the milk; season with salt and pepper to taste. Turn the heat to medium-low and pour in the eggs. Cook, stirring, for about 2 minutes. Add in the cheddar and sausage crumbles, and continue to cook, stirring fairly often, for about 6-8 minutes or until eggs are cooked through. Fill tortillas with about 3-4 tablespoons of the egg mixture and fold over or roll up. Serve with bacon, Tabasco, and cilantro. Don’t Forget! There is still time to win some free Xagave nectar and the Where Delicious Meets Nutritious cookbook! Check it out here! Also, check out Chocolate Covered Katie, she’s giving away a Vita-Mix! Yes, it’s another “leftover turkey” post. Not because I have that much turkey. (I might after Thanksgiving though – and if I do, I’ll happily make these again.) I’m sharing this post with you because they’re that good. Honestly, they are good any time of year, with just about any filling. Leftover chicken? Great. Ground beef, turkey, pork, chicken? Awesome. Beans and cheese? Wonderful. In fact, I make a version of these throughout the year using ground beef or turkey and a can of black beans. The beauty of the recipe is that it’s flexible. I like flexible. I’ve posted enchiladas here before. (and here.) And while those are both good recipes, (I’ve since subbed in corn tortillas to make them gluten-free. Besides, corn tortillas are just better in my opinion.) I have worked throughout the year to improve upon them. Specifically, I’ve worked to improve the enchilada sauce. Why? Because I can’t leave well enough alone. I always have to improve, experiment, and explore flavors. I wanted an enchilada sauce that intrigued the taste buds with a wonderful depth of flavor and a nice heat – not too hot. Finally, I have found it. I think. At least, for now. This sauce does not use tomatoes in it, as some Tex-Mex red sauces do. Instead, I have opted to use a number of various dried chiles as the base. I could wax poetic about my love for dried chiles. They store in my pantry quite well. They smell amazing. The flavor they contribute is far superior to any store-bought chile powder. In my opinion, they are worth the extra time and effort to use them. I found quite a few varieties at Wal-Mart, but you can usually find the widest variety at a grocery that caters to the Latin American community. You can also find them online. In this sauce I used a combination of ancho, New Mexico, guajillo, pasilla, and chipotle peppers. You can certainly streamline and use fewer varieties, or change it up and use other chiles, but I enjoyed the combination – it added depth and complexity to the sauce. Another note – when toasting the chiles, it’s probably a good idea to open a window or two. The aroma of the chiles can be overpowering – it makes me sneeze! Again, totally worth it – promise! These aren’t quite authentic Mexican enchiladas, nor are they true Tex-Mex. I’d like to think I made a new “Tex-Mex” version, taking what I love best about both cuisines and interpreting it in this delicious version. Whatever they are, I hope you’ll agree that they are a wonderful way to enjoy your turkey leftovers! Meanwhile, bring a skillet to medium heat and add olive oil. When oil is shimmering, add onions and garlic. Saute for 10 minutes or until soft. If they start to brown, reduce heat a little. Remove chiles from the soaking water with tongs and place in a blender, leaving the water in the pan. Add the onions and garlic, leaving as much of the oil in the skillet as possible, and add about 1 1/2 cups of the chile soaking liquid. Blend until smooth, adding more soaking liquid if needed. The sauce should resemble the consistency of canned tomato sauce. Pass the sauce through a fine-meshed sieve and discard the pulp. Pour the strained sauce back into the saucepan and place on low heat. Salt to taste. To assemble the enchiladas, dip a tortilla into the chile sauce and remove, allowing excess sauce to drip back into the saucepan. Place about 2-3 tablespoons of the shredded turkey mixture in a line down the center of the tortilla. Roll up the tortilla and place it seam-side down in a 13X9 baking dish. Repeat with remaining tortillas. Top with a bit more sauce down the center of the enchiladas, and sprinkle the shredded cheese over. Bake for 20 minutes, or until browned and bubbly. Garnish with cilantro and sour cream, if desired. Happy Thanksgiving everyone! I sincerely wish the best for you and your family this holiday. Be happy, safe, and enjoy the gifts of life. I am thankful for all of you! Without you, there would be no Tasty Eats At Home. Have a wonderful holiday. For the past few months, time seems to have flown by at an incredible rate. It seems as though I barely have enough time to complete the “must-finish” tasks each day. Work, family, lawn work, the garden, dishes, the shed that still remains half-painted…and let’s not forget feeding the family with reasonably healthy meals, all the while minding the budget. And of course, I must devote my time to the blog. It holds me accountable. It forces me to improve myself, in the kitchen, with the camera, and in my writing. I have to admit, I am addicted. I think this is a good thing. But I do strive to keep a balance. Okay, so I sometimes slip. (full disclosure: ate Taco Smell Bell last week for dinner one night, and visited the snack machine at the office on more than one occasion, in order to complete meals for myself. As if M&Ms and Rice Krispies Treats count as part of a meal.) But I do keep trying. This week, I was determined to create healthy dinners that took minimal time in the kitchen, freeing me up to tend to other duties. I did make a few slight modifications. I added a bit of onion for flavor, and I increased the cumin, because I love the earthy depth it adds. I also used regular tortilla chips, as I had them on hand. It was a great weeknight dinner, full of smoky flavor and just the right amount of heat. Of course, we tend to like things pretty spicy in our house, so if you’re a bit nervous about adding all of the chipotle chile powder, I suggest starting with half, and add more at the end if you feel the soup needs more kick. Heat oil in a large saucepan over medium-high heat. Add onion and chicken breasts, sauté 2 minutes. Add garlic, sauté another minute. Add chile powder and cumin, stir well. Add water, salt, broth, and tomatoes and bring to a boil. Cover, reduce heat, and simmer 5 minutes. Top with tortilla chips and cilantro, and serve with lime wedges.